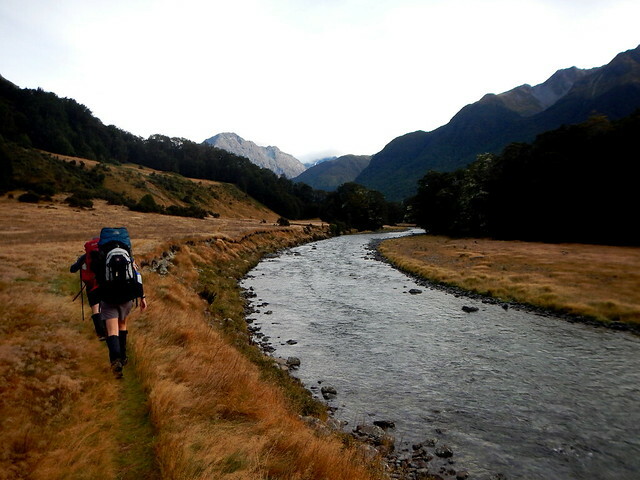 I finally had my first real life NZ tramping experience! It was awesome, and I hope there are many more to come. In this spirit, I have created a new post series titled “Track Trek” where I will be providing summaries of all my tramps [edit – new tag is just “Camping”]. 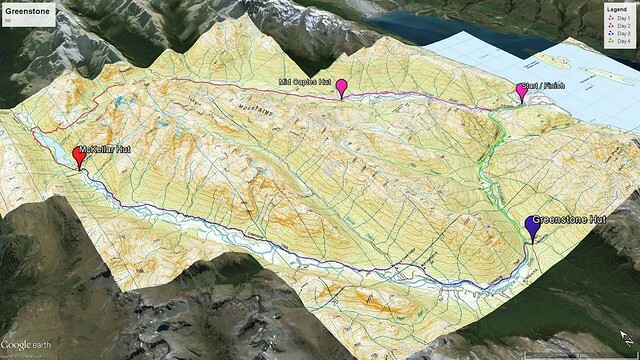 For those of you not from New Zealand tramping is equivalent to hiking, not what you think it is. 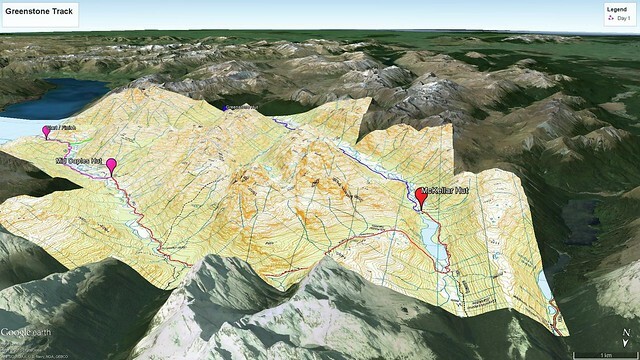 My first tramp was on the Caples – Greenstone loop. It took 4 days (07-04-15 to 10-04-15) during which we traveled a total of 57.5 km (35.7 miles) with a 671 m (2,200 ft)vertical accent/descent. I went with two of my office mates and an Australian visitor. The overall path taken for my trek. Dots represent huts where we spent the night and lines indicate paths traveled each day. The track is located in the Fiordlands National Park, which is about a 4 hour drive from Dunedin, but well worth the trip. The park is located in a mountain range that spans most of the western coast of the southern island. This range is formed through subductive action of the Australian and Pacific tectonic plates, which New Zealand straddles. These mountains were then carved out by glaciers during the last ice age, which gives them their distinctive topographical features such as deep river basins and moraine wetlands. The southern tip of Ne Zealand’s southern island. 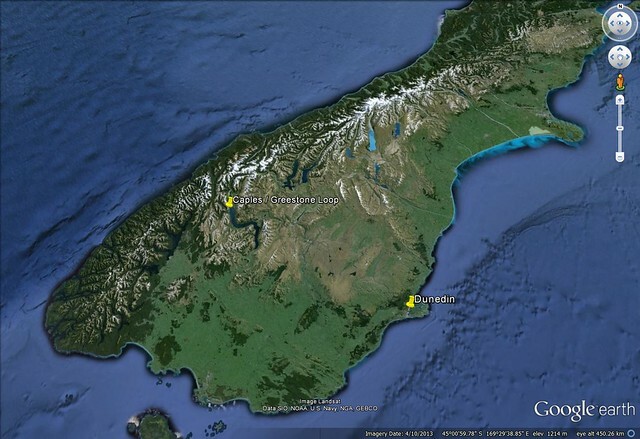 The two pins represent Dunedin, where I live, and the Caples-Greestone Track. On the first day we meet up in the early morning, got a tall take away cuppa coffee, and started our journey with a short road trip. After pleasant drive through the scenic countryside, we hiked into the first hut at 8.4 km in. 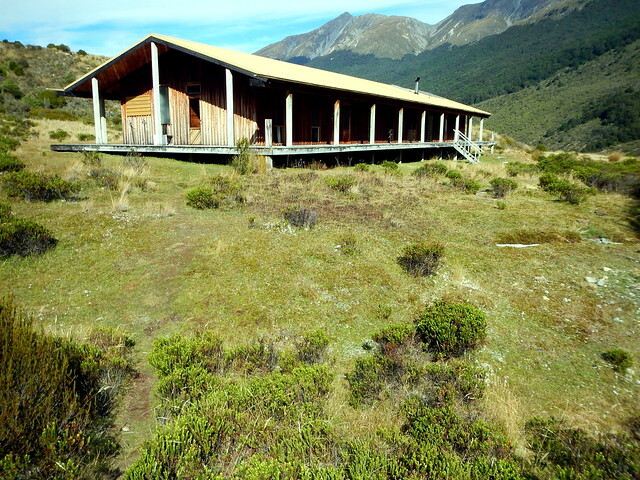 The Department of Conservation maintains many huts around New Zealand. The are minimalist trail houses with running water, wood burning stove, counter space for cooking, tables for eating, and bunks. The trail taken the first day is indicated by the pink line. The trail starts on a field edge and gradually climbs up the valley wall into the beech forest. An example of one of the huts maintained by the Department of Conservation. For only NZ$15 this could be your home for the night. On the second day we hiked 20.2 km as well as most of the vertical as we traveled to McKeller Hut from Mid-Caples Hut. Most of the hike was though beech forest, though there was a substantial area of alpine bog as we traversed McKeller Saddle. This was by far the most intense day of hiking and I was worn by the end of it. I also got some nice blisters. The trail traveled the second day is indicated by the red line. 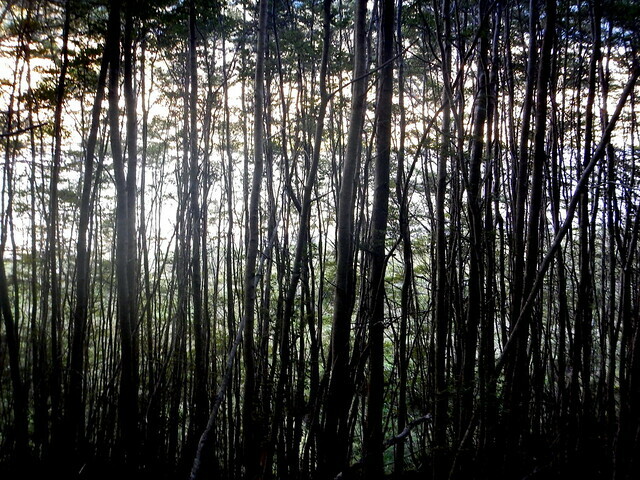 This trail starts in the beech forests, which transitions into a podocarp – broad leaf mixed forest as you climb the mountain. 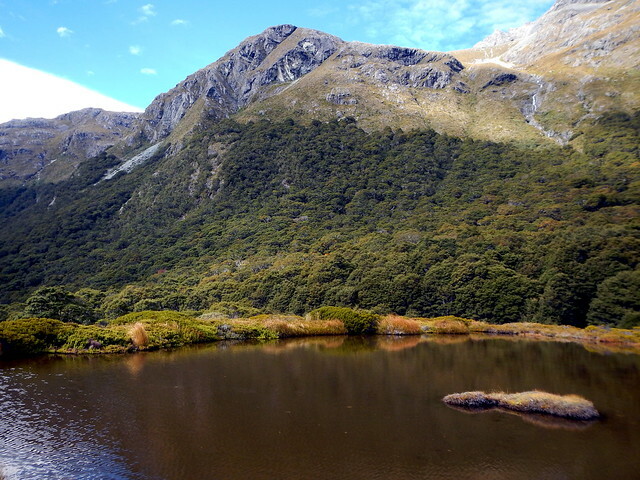 The peak of the pass is an alpine bog, which turns back into beech forest during the steep decent and around the lakes. The top of the McKellar saddle (or mountain pass) at 996m above sea level. The area is dominated by alpine bog vegetation. 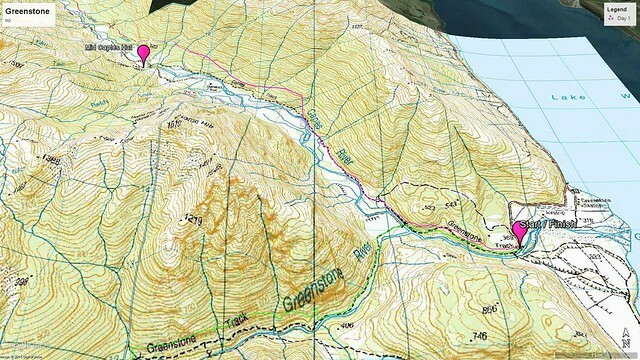 On the third day we hiked to Mid-Greestone Hut from McKellar hut, a total of 18.1 km. We had some stunning views as we walked past some lakes, and even managed to take a swim at the beach. Most of the hike was beech forest. We were able to see many green basalt rock formations from which the track gets its name. Those stones are precious to the native Maori culture and are often worn as ornaments. The path traveled day 3 is indicated by the blue line. This trail starts as in the beech forest and opens up into field as you enter the valley bottom. The trail descends to the valley floor and follows the river down the valley. 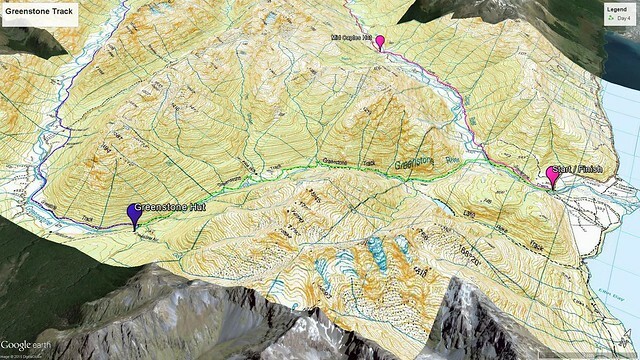 On day four we traveled to the car park from Greenstone Hut (10.8 km). Most of this was in the valley basin where we were able to see many sheep and rivers. We also saw many fungi growing in the wet soil. It was an easy and relaxing final day to an awesome trip. The trail taken day 4 is indicated by the green line. The trail follows the river. 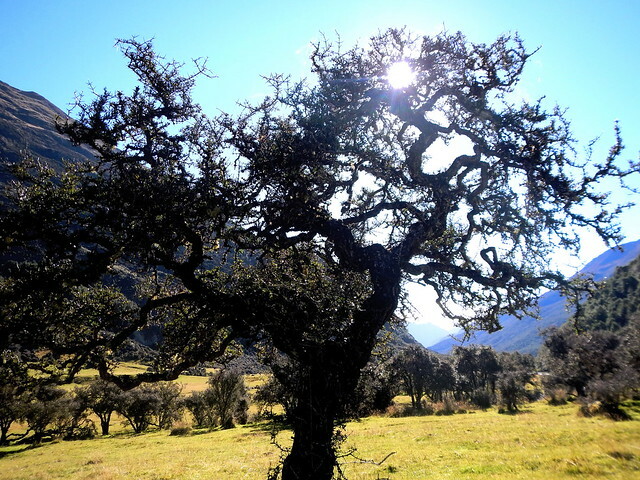 The native Matagouri tree in open field habitat. Native beech forest along the river banks. In conclusion, my first tramp was rad as. It was one of the coolest things I’ve done since being in NZ and I can’t wait for the next one! Who wants to go with me? 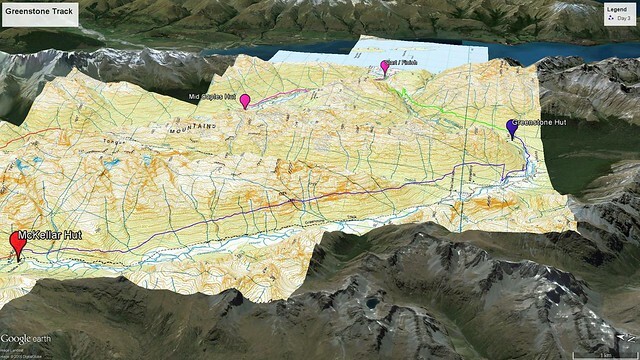 Categories: camping | Tags: adventure, blog post, camping, Gregory Thomas Nelson, new zealand, tramping | Permalink.